I don't know about you, but over here at my house, we were totally obsessed with the Olympics. Both my husband and I said we enjoyed it more this year than ever before. I know that had to do with the amazing performance of Michael Phelps--8 golds in one Olympics-WOW! Maybe it also had something to do with high gas prices and us being stuck at home! 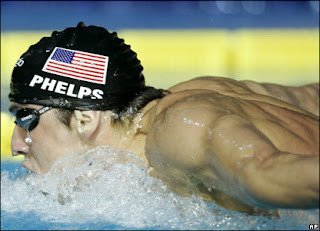 My sweet husband has been inspired and has Phelps Phever! You see, my honey is a 29 year-old man who cannot swim (sorry I told your secret!). So, he's decided to take swim lessons beginning next Tuesday for the next month. When he called the aquatic center in our city, he asked the person on the other line, "What's that style of swimming Michael Phelps does? That's what I want to learn!" I thought that was so cute! As he went to go pay his fee today for his swim lessons, an elderly woman of at least 106 years-old (according to my husband), took one look at him and said, "Your'e gonna sink straight to the bottom!" Isn't that a hoot!!! Truth is, I admire him for having the courage at 29 to try to learn how to swim and not let fear or pride get in the way of his desire to learn how to swim. Keep checking back in & see how D is doing in swim lessons! What about you? Did watching the Olympics inspire you? If so, how? Thanks for putting me out there!!! by the way....she really was a 106! LOL! It's ok D. Bolton, I'm always insprired during the olympics. Keep the dream alive!